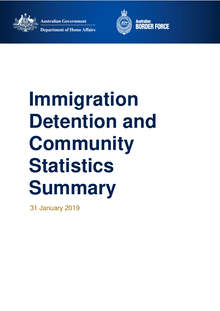 At 31 December 2018, there were 1285 people in immigration detention facilities. A further 696 people were living in the community after being approved for a residence determination and 15,674 were living in the community after grant of a Bridging E visa. At 30 November 2018, there were 1327 people in immigration detention facilities, including 1327 in immigration detention on the mainland and in immigration detention on Christmas Island. A further 599 people were living in the community after being approved for a residence determination and 16,007 were living in the community after grant of a Bridging Visa E.
At 31 October 2018, there were 1366 people in immigration detention facilities, including 1366 in immigration detention on the mainland and no people in immigration detention on Christmas Island. A further 485 people were living in the community after being approved for a residence determination and 16,216 were living in the community after grant of a Bridging Visa E.
At 30 September 2018, there were 1305 people in immigration detention facilities, including 1270 in immigration detention on the mainland and 35 in immigration detention on Christmas Island. A further 444 people were living in the community after being approved for a residence determination and 16,481 were living in the community after grant of a Bridging Visa E.
At 31 August 2018, there were 1303 people in immigration detention facilities, including 1227 in immigration detention on the mainland and 76 in immigration detention on Christmas Island. At 31 July 2018, there were 1345 people in immigration detention facilities, including 1172 in immigration detention on the mainland and 173 in immigration detention on Christmas Island. A further 386 people were living in the community after being approved for a residence determination and 17,029 were living in the community after grant of a Bridging Visa E.
At 30 June 2018, there were 1347 people in immigration detention facilities, including 1108 in immigration detention on the mainland and 239 in immigration detention on Christmas Island. A further 368 people were living in the community after being approved for a residence determination and 17,4 20 were living in the community after grant of a Bridging Visa E.
At 31 May 2018, there were 1344 people in immigration detention facilities, including 1070 in immigration detention on the mainland and 274 in immigration detention on Christmas Island. A further 368 people were living in the community after being approved for a residence determination and 17,668 were living in the community after grant of a Bridging Visa E.
Will Australia Provide Justice for Afghanistan War Crimes? The accounts are both shocking and horribly familiar. Soldiers acting as if they were above the law assault and murder civilians in a barbaric competition to outdo each other. New recruits compelled to prove themselves by killing. The victims are not enemies in battle but the elderly, men with disabilities, a farmer on his way to buy flour – essentially anyone who can’t fight back. At 26 April 2018, there were 1369 people in immigration detention facilities, including 1065 in immigration detention on the mainland and 304 in immigration detention on Christmas Island. A further 457 people were living in the community after being approved for a residence determination and 17,980 were living in the community after grant of a Bridging Visa E.
The table below reflects figures based on records in Department of Home Affairs systems. 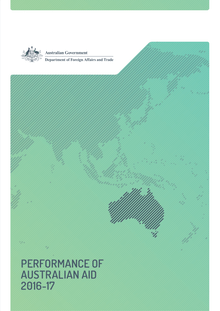 This Performance of Australian Aid report assesses the performance and results of the Australian aid program in 2016-17. At 31 March 2018, there were 1389 people in immigration detention facilities, including 1059 in immigration detention on the mainland and 330 in immigration detention on Christmas Island. A further 452 people were living in the community after being approved for a residence determination and 18,325 were living in the community after grant of a Bridging Visa E.
At 28 February 2018, there were 1337 people in immigration detention facilities, including 1004 in immigration detention on the mainland and 333 in immigration detention on Christmas Island. A further 442 people were living in the community after being approved for a residence determination and 18,783 were living in the community after grant of a Bridging Visa E.
At 31 January 2018, there were 1287 people in immigration detention facilities, including 953 in immigration detention on the mainland and 334 in immigration detention on Christmas Island. A further 447 people were living in the community after being approved for a residence determination and 19,129 were living in the community after grant of a Bridging Visa E.
At 31 December 2017, there were 1285 people in immigration detention facilities, including 958 in immigration detention on the mainland and 327 in immigration detention on Christmas Island. A further 448 people were living in the community after being approved for a residence determination and 19,590 were living in the community after grant of a Bridging Visa E.
At 30 November 2017, there were 1301 people in immigration detention facilities, including 988 in immigration detention on the mainland and 313 in immigration detention on Christmas Island. 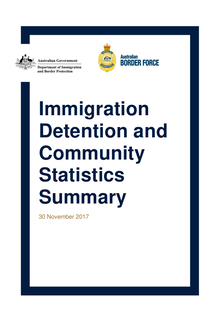 A further 454 people were living in the community after being approved for a residence determination and 19,907 were living in the community after grant of a Bridging Visa E.
At 31 October 2017, there were 1264 people in immigration detention facilities, including 950 in immigration detention on the mainland and 314 in immigration detention on Christmas Island. A further 459 people were living in the community after being approved for a residence determination and 20,355 were living in the community after grant of a Bridging Visa E.
The table below reflects figures based on records in Department of Immigration and Border Protection systems. At 30 September 2017, there were 1257 people in immigration detention facilities, including 929 in immigration detention on the mainland and 328 in immigration detention on Christmas Island. A further 492 people were living in the community after being approved for a residence determination and 20,599 were living in the community after grant of a Bridging Visa E.